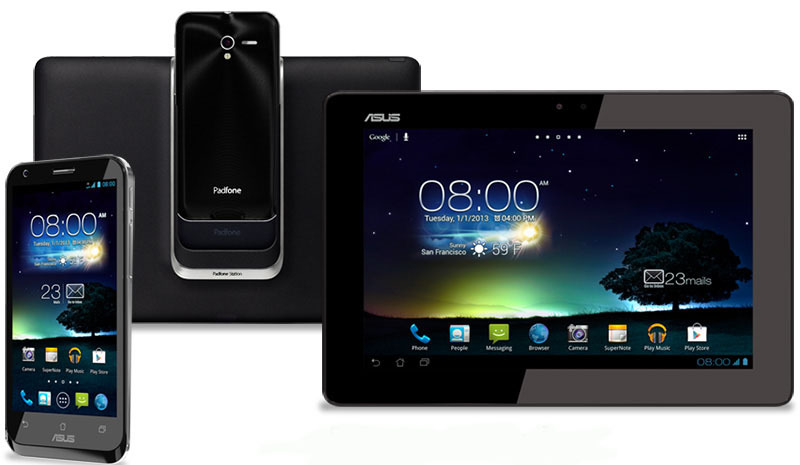 ASUS has today announced PadFone 2 (Tablet+Phone) with 4.7" inches fone (phone) and 10.1" inches pad (tablet) in one gadget, in an effort to strengthen it's PadFone series. The PadFone 2 comes with support for 3G and 4G LTE connectivity. ASUS's PadFone 2's Fone (phone) features 4.7 inches HD 1280x720 Super IPS+ Resistive touch panel phone and PadFone 2's Pad (tablet) features 10.1 inches WXGA 1280x800 IPS Capacitive touch panel pad (tablet). Slide the 4.7" PadFone 2 into the 10.1" PadFone 2 Station for an expanded view with the layout optimized for pad mode for easy reading! Running on Android v4.0.3 (Ice Cream Sandwich) OS, the PadFone 2 features Quad-Core 1.5GHz processor, 2 GB of RAM. When it comes to connectivity PadFone 2 features WLAN 802.11 a/b/g/n connectivity and Bluetooth v4.0. PadFone 2 equipped with 13MP Rear camera with Auto Focus and F2.4 Aperture. The camera can record video at 60fps and can capture 100 consecutive photos, coupled with 30% enhanced color and contrast. PadFone 2's PadFone Station also equipped with 1 Mega-Pixel Front camera for video calling.